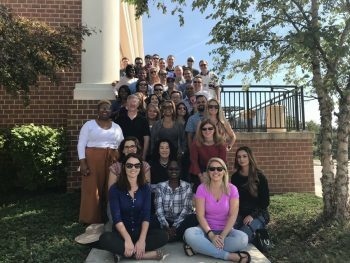 Last week our class headed to Gettysburg, PA for our first “offsite” learning sessions. 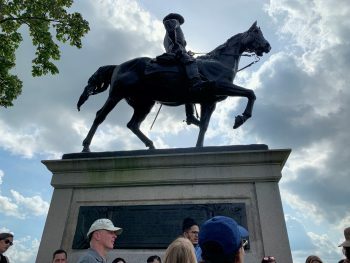 These three jam-packed days included interactive workshops, situational role-playing, a staff-ride through the Gettysburg Battlefield, and yes, some time for “networking”. Before heading off to Gettysburg, each of us completed a DiSC Personality Assessment and an analysis of our leadership styles was conducted. This assessment helped match each of us with our government or industry partners. Additionally, it helps us better understand how to interact with other leaders and build more effective relationships. My assessment found that I have an “Si” leadership style. This means I lead based on Steadiness and being an Influencer, while also having some “D” (Dominance) tendencies. The assessment also said that valuing collaboration, supporting others, and generating enthusiasm are my biggest strengths as a leader. I’d say that the assessment was spot on in that regard. Who knew I was so predictable! We participated in a workshop to learn how to exploit our styles and how to better interact with those who have opposing styles. Monday afternoon we took a Staff Ride through the battlefield. Now, staff rides differ from regular tours. These rides are specifically developed for members of the US Army and other government groups. Additionally, they mostly focus on the Union and the Confederate’s leadership decisions. Our guide took us to the locations where the Generals made the crucial decisions that ultimately led to the turning point of the Civil War, as the momentum shifted in the North’s favor. We were asked to think about the strategic, operational, and tactical decisions that the Generals had to make, and what mistakes were made during the three-day battle. The staff ride was an interesting take on a subject, the Battle of Gettysburg, that we all are familiar with but few actually understand the specifics of. The “Mythbusters” workshop held on Tuesday was the highlight of the offsite for me. During this session, all those who work in industry played the role of government employees, and vice versa. The workshop provided ground rules on what we could and could not do, based on what real government and industry employees can do. We then worked through real-life scenarios, such as a procurement information session and a debrief session, with clear objectives that each side had to achieve. I served as a Contracting Officer during these scenarios, a role that I have never played before. The workshop gave me some new insight into handle these situations in my real-life role. I look forward to participating in more of these role-playing workshops in the future. Calling this program intensive is no joke, and this offsite was just the start. Through graduation in May 2019, we have two or three “official” required training sessions each month, including additional offsites. We also have mentoring sessions, team workshops, and an individual Capstone project that we each need to complete. Despite the major time commitment, I look forward to future sessions and getting to know my fellow Voyagers more. I will be sure to share more thoughts on this blog as the program progresses.